Bernie Taxis are travel experts and integral to our impeccable fleet, are a 19 plus 16 seat and one 11 seater minibus. Available for long term contracts and one off bookings from Tavistock and the surrounding areas. These vehicles are perfect for a diverse range of clients from, group travel to weddings, events or private functions and where we can we will accommodate individual requests for either point to point hire or drop offs. 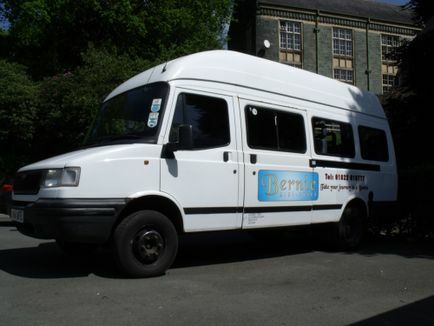 If requested, the driver will stay with the group so that your transport is ready and waiting for your return journey. All of our minibus drivers hold PCV licenses and are CBC certified so you know you are being driven by qualified chauffeurs and are in safe hands. The buses are fully plated and function with an operator’s licence. We put our customers first and so to ensure the safety of our passengers, both buses are fully fitted with seatbelts and are either front or side loading so can be used for school contracts or individual bookings alike. Call us for a quote for your function whether you are looking for minibus hire in Tavistock or beyond, you can rely on Bernie Taxis to ensure you get to your destination safely and swiftly. Please do not hesitate to call us today to discuss your requirements; we will always aim to offer a competitive travel solution ensuring you won’t be disappointed in the service provided by one of the area’s leading taxi companies. CLICK HERE to make an online enquiry today.